Martha’s Not Showing Enough LOVE for SOUTH DAKOTA!!! If you haven’t gotten, or read the July* issue of Martha Stewart Living Magazine, I’m sorry you’ll have no clue what I’m talking about…bare with me. 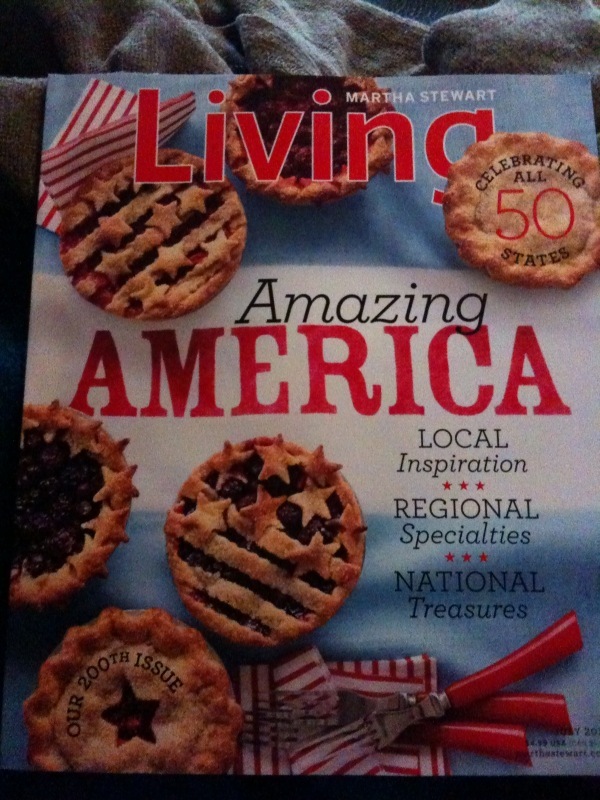 The issue is all about America, the land I love. Celebrating all 50 states! So, I was rather excited to see what she had to say about South Dakota, my home, my birthplace, the state I love, even thought I grew up in Nevada, and now live in Colorado. What, where’s South Dakota on this page, I’m not seeing anything…oh wait, Raelynn, look almost to the binding of the magazine, there, there it is, that tiny picture and 1 complete sentence. 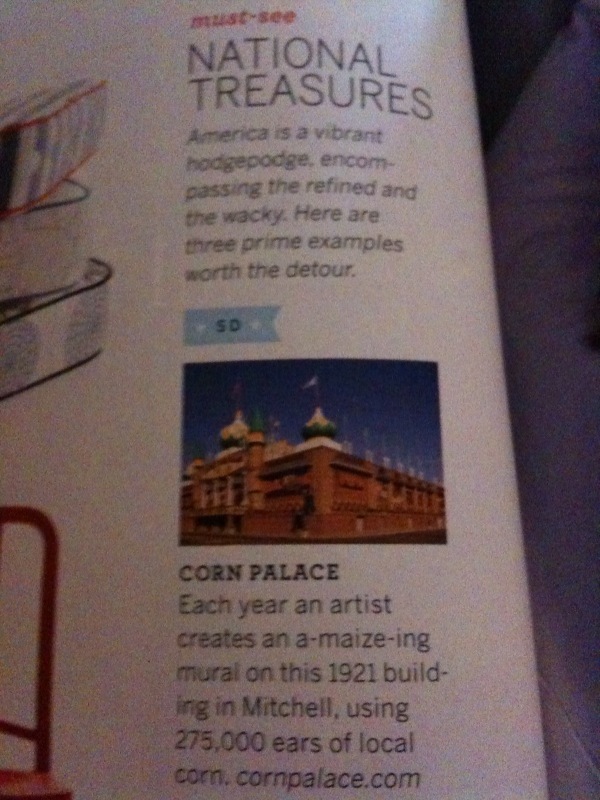 Now, I’m not complaining about that the fact that the Corn Palace was what represented SD, but I would have thought for something about our state that’s listed as a “National Treasure” that Mount Rushmore is what I would have seen, I mean, after all, it is a National Treasure, right? And I must say, I do love Martha, but was a bit disappointed about this…. 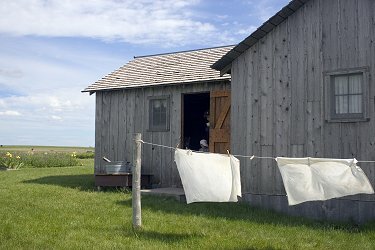 Well, if Martha’s not going to show you what South Dakota’s about I will. And if you’d like more information on the GREAT state go check out South Dakota Tourism website for many more fun family activities. First we have Mount Rushmore National Memorial The carving from sculptor Gutzon Borglum, which he started in 1927, and over the year cost about 1 million dollars to complete. Mount Rushmore pays tribute to President Washington, President Jefferson, President Roosevelt, and President Lincoln. The Avenue of Flags is beautiful, each state flag with the states name and year it entered into the Union carved into the granite. And from May to Sept. if you’re their at 9pm you’ll see the lighting ceremony of the mountain. Simply a beautiful place you must see. Oh and one more thing, if your going to go, and you must, take Iron Mountain Road, it’s a longer drive but WELL WORTH IT. You’ll take the “Pigtail Bridges” and get some of the greatest views of the Presidents without even being in the park yet. 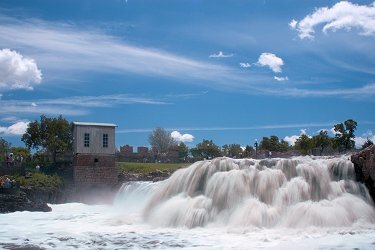 Falls Park, in Sioux Falls, you’ll enjoy the beauty of the Big Sioux River, that gave the city it’s name. There’s a 5 story observation tower that you can intake the views of the falls and river. And make sure you stop but the visitor center and get yourself some pink quartzite that is seen throughout the park. Deadwood an entire city that is a National History Landmark. 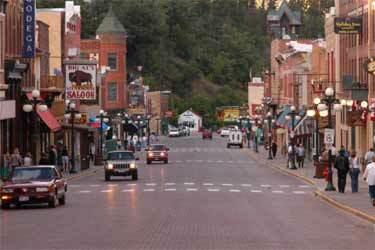 A city that was the setting of the HBO hit properly titled “Deadwood”. 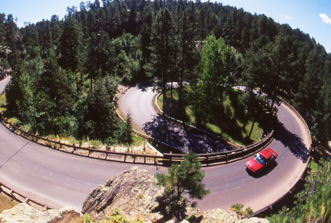 The city was established in 1876 during the Black Hills gold rush, many outlaws such as Calamity Jane and Wild Bill Hickok came in, but Wild Bill didn’t leave alive, you can go to the No. 10 Saloon on Main Street and right above the entrance is the chair he was sitting in as he played poker and was shot in the back of the head by Jack McCall in Aug of 1876. (if my PC wasn’t dead, I’d have a picture to show you). A great place to visit, to really feel that old sense of town, and learn about the gold rush history. Laura Ingalls Wilder home in De Smet, where you can discover what Laura talked about in the Little House books. And what most people know too, of the TV show Little House on the Prairie. For those of you who are book worms this is a great place to visit and experience in real time, what you read. For me, this would be like going to Forks, WA, and living the life of Bella, in the Twilight Saga (just a little comparison for ya). 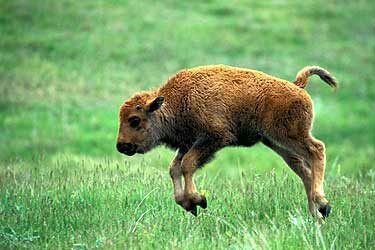 Isn’t this baby buffalo just too cute for words….yeah, I think so. You can get a look at them at Custer State Park, 71,000 acres of pure beauty, one of the only places in the country where buffalo roam free about 1,300 of them, and don’t be in a rush driving though the wildlife loop, they may stop traffic as the cross the highways, so bring your patience, and if your there in late September, early October you can witness the buffalo roundup. Sturgis…enough said, right? I mean who hasn’t heard of the Sturgis Motorcycle Rally…if you’ve ever seen a biker, you’ve probably seen a Rally shirt…there are a few hangin’ in my closet. It’s one wild good time, with everything biker involved. If you go, its usually the first to second week in Aug, this years it’s the 9th-15th….you’ll take in food, souvenirs, tattoos, concerts, and see the sights, and defiantly the sound of the “hog” on the main drag. And please don’t say I didn’t warn you: this isn’t really a “kid friendly” party….just sayin’…. Black Hills Gold, I think every time I’ve gone to SD I’ve gotten something new, Black Hills Gold will always consist of leafs, one pink and one a light green, and a cluster of 3 gold “grapes”, because when the young French goldsmith, Henri LaBeau came to the Black Hills to find gold he got lost, and nearly died, when he came upon wild grapes that basically saved his life, once he found gold, he created what was then names Black Hills Gold which they though was good luck, and to honor LeBeau they now use the pink and green leafs with a cluster of gold grapes to signify what saved his life. WAIT I actually have two more….I’ve actually save the BEST FOR LAST…. Every September, in the one and only HURON, SD!!! 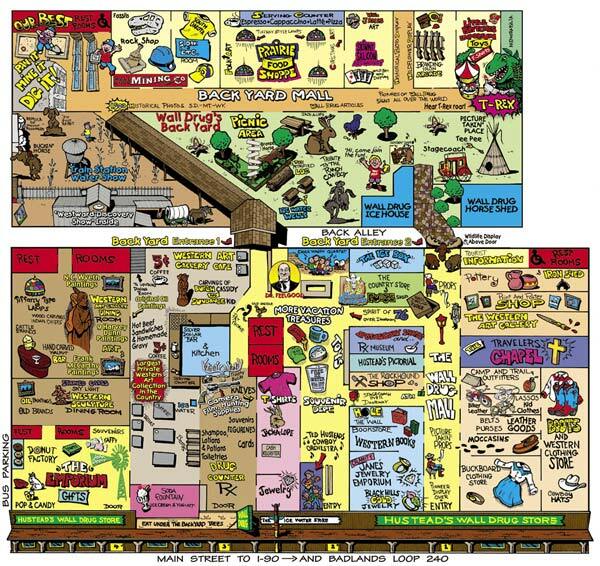 (my birth place)….my daddy always told me, that a long time ago, people came to Huron and asked the townspeople if they wanted to be the states capitol, or host the state fair…and that we, Huronites, choose to take the state fair!! Now, this is probably just something pop’s told me for shits and giggles, but when I was young, it was a cool story, so I’m stickin’ to it. With a carnival, concerts, stock car racing, SD State Fair Pageant, BBQ Cook-Off, ect….You can never go wrong with a state fair, well, I guess you can go wrong if your on a diet, because we all know, fair/carnival food is anything but healthy! He’s located in Huron, so while your there for the state fair, go check him out. You’ll find him at what was once the Huron Liquor Store on the east side of town on Highway 14, he’s 20 feet tall, and 40 feet long, so go and take your picture with him, as it’s on of South Dakotas best roadside attractions. Also, further in town on Hwy 14 is a White Buffalo at Prostrollo Car Dealership, that’s 12 foot tall and 20 foot long. 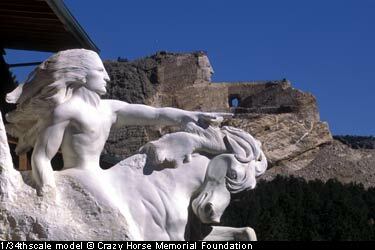 He’s white because it was believed by the Plains Indians that the white buffalo was the child of the Sun God. Well there ya go, South Dakota in my nut shell. Please don’t be deterred from ever visiting South Dakota, it’s a great place, and family friendly (except that one week in Sturgis). 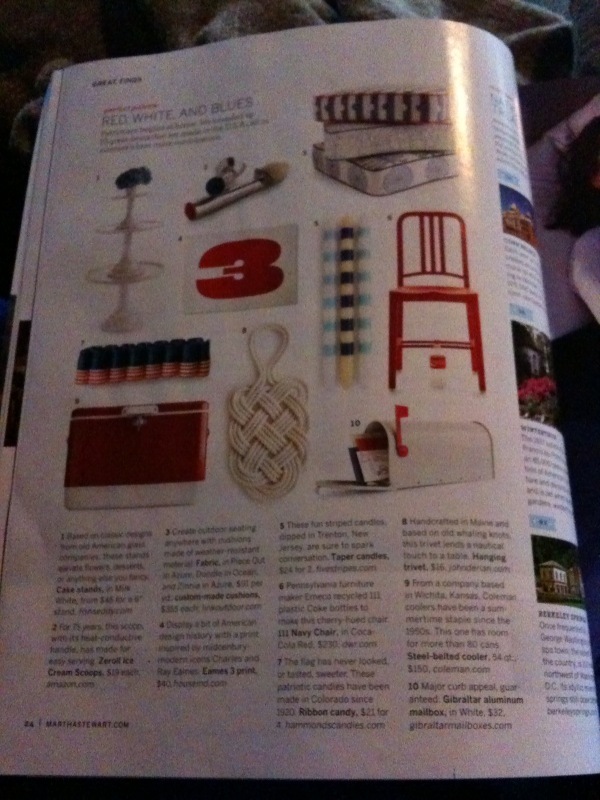 *This post was writen 2 years ago, so it’s from Martha Stewart’s July 2010 mag…..I was telling a co-worker/friend (Hi Sean) about SD since he is takin the family up there this 4tho of July weekend, places he should visit and thought I would update…. 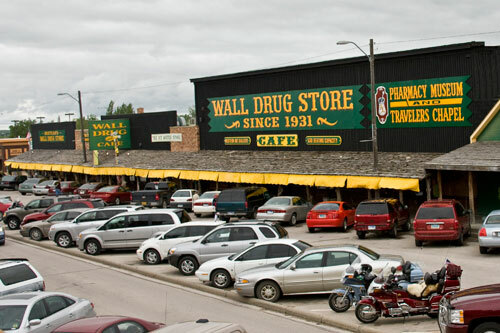 Categories: Life, Travel | Tags: Black Hills Gold, Crazy Horse, Custer State Park, Deadwood, Falls Park, Iron Mountain Road, Laura Ingalls Wilder, Martha Stewart, Mt Rushmore, Pig-Tails, SOuth Dakota, South Dakota State Fair, Sturgis, Travel, Wall Drug, Worlds Larget Pheasant | Permalink. I read last year that the SD State Fair was closed forever, and Huron had sold the fairgrounds. Is that not the case? My father had the first Pronto Pup stand at the SD State Fair, back in about 1958-60. Mary, not that I know of…my dad still lives there, and he doesn’t know anything about the fairgrounds being sold, and so far form what we’ve heard the fair is still happening…I guess we’ll see come August.